Frank Edward Calabro Jr. has a history of scamming people dating back to Zeek Rewards and beyond. Since Zeek Rewards was shut down by the SEC in 2012, Calabro Jr. has promoted train wreck after train wreck of collapsed scams – profiting handsomely along the way. It seems the law has finally caught up with Calabro Jr., following a securities fraud cease and desist issued by North Carolina. Calabro has been in the business of affiliate marketing for at least the last five years. Following an internal investigation, the North Carolina Securities Division found Calabro Jr. has been promoting scams through “Planet Millionaire”. Scams Calabro Jr. is currently promoting on Planet Millionaire include Power Lead System, Crypto World Evolution and Global MoneyLine. The Securities Division adds USI-Tech and their BTC Package Ponzi scheme to the list, citing a cease and desist issued by Texas in December, 2017. Based on Calabro’s representations of the BTC Packages, investors have purchased the packages because they were given the impression that they could profit from the guaranteed returns provided by USI-Tech’s efforts in the areas of automated trading and cryptocurrency mining. The BTC Packages have all the hallmarks of a security, are not registered as securities in North Carolina, and are not exempt from registration. solicitation of the investing public poses an immediate and significant threat of irreparable harm to the public welfare. Calabro Jr. has twenty days to request a hearing to defend himself. If the North Carolina Securities Division receives no response within thirty days, Calabro Jr’s cease and desist will be made permanent. 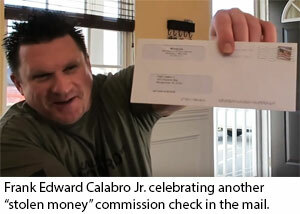 Reporting Calabro Jr to the North Carolina Securities Division weekly finally paid off. OMG, this is absolutely great news! This scumbag is finally getting the attention he deserves! *slow clap* wheres your “love my haters” post now Calabro Jr.
Why do people still listen to this loser? Jay Carey: Why do people still listen to this loser? More importantly “which” people and how many of them are there in reality ? That’s great news! Let’s hope that vile J.Ryan Conley is next on the list! He was a big promoter in USI-TECH. He’s a Crypto World Evolution top promoter now. Hopefully the Cease and Desist slows his scamming of people in other similar schemes for a few days at least. Hopefully it will be Septic Simon next! I can think of at least 50 I would love to see them go after on the National level, but also would love for the states to do the same thing as North Carolina. Good to see some action, but this type of warning didn’t really stop Faith Sloan, so we’ll see what type of effect it actually has. Authorities need to step up their game with these guys to make at least a little dent. The Ponzi Midget FINALLY gets the attention he deserves. Frank Calabro Jr. was making claims of being a “24/7 killer” on facebook back when he was in the Marines. Turned out he worked in the motor pool & changed oil & tires. I noticed that above statement is gone from his FB page. REAL Combat Marines must have cracked his dwarf behind. I have a feeling the ponzi midget will find a way to circumvent the law and continue on with his scamming ways! It is such a relief to have a second state comprehend that while it is easy for a criminal to throw up a website and make outrageous claims of impossible returns, none of these SCAMS would grow beyond the “nickel-n-dime” garden-variety fraud without frenzied promotion by these Ponzi pimps. Great news Lee Oakley next in the States and hopefully the vile Sharon James and evasive John Smith next here in the UK ! Also what about that strange OJ Jordan?! Well, Faith is in deep doo-doo with her role in Telex-Free, that is once it gets to court. I am shocked that the Feds didn’t revoke her freedom by her violating the terms of her indictment with the other Ponzi’s she started promoting when told not too. It’s not like they didn’t know about them because they did. Of course Faith keeps moving around so it might be hard for them to find and arrest her. Who knows, maybe they are just adding them to the list of charges she will face when her trial starts. One can hope. You have to understand that Faith, and all the other Ponzi pimps, never believe they have done anything wrong. They all use the “I didn’t know” excuse. One would think that with Faith, and now Frank, it might make others stop and think it just might happen to them too. Nah, they are too narcissistic and sociopath to stop. All is well … be back in a few days! but i don’t think things will ever be the same again in colabro’s scam sunshine world. looking back over your shoulder constantly is a speed impediment after all. What type of people follow this “promoter”? Wittle Fwankie C-The worlds most dwarfish Ponzi pimp got everything electronic, get away $, etc seized according to this warrant. I especially loved them finding $50K in the glove box of his truck. Gotta have that cash handy in case you want to do a quick video and need the cash as prop. Sadly this guy has more money than brains, but now the money is gone, as least what was found in the search warrant. The people who follow him are gullible, they see the cash he flashes, the checks, his computer screen of his “earnings” and they believe it is all real and from a legitimate business. They don’t do any due diligence. Wonder what his “Rock Stars” think of him now? lol. Planet Failure finally bites the originator. you know IAmUnemployed is looking over his shoulder. This is incredible news! Now go after all the other major pimps! Get Em Ponzi Slayers! Wonder if Oklahoma Securities will follow suit going after Short Stack’s right hand Ponzi Partner? Clay Montgomery founder of Speedfeeder Matrix FLOP, creates scams, takes in bucks and closes shop, moving onto his next scam, DFY solos and major pimping Ponzi player. Someone should look into Aron Parker too. He was big into powermining pool and is now promoting a new scam called digital tycoons. This guy is a real A-Hole! I’m glad they finally caught up with him. I had 1 dealing with this dude during the beginning Traffic Monsoon days and I never wanted anything to do with him ever again! People really do sow their own karma. This isn’t accurate information at all. I live near this man and 99% of this write up is false BUT, believe everything you see/read …take responsibility for yourselves and the risks you chose to take. take responsibility for yourselves and the risks you chose to take. Funny how this never applies to scammers, only their victims. I think you’ll find authorities are precisely holding Frank Calabro responsible for the risks he’s taken promoting various scams over the years. Whether you live near scammers is neither here nor there. Regina Johnson: take responsibility for yourselves and the risks you chose to take. Good luck living in a world where deliberate fraud is permissible and victims are to blame, Regina. HINT: Don’t ever go out at night, don’t drive on the freeway at peak hour and never wear something that could be considered provocative. Ok, that’s why he’s a free man right now… because he did nothing wrong. They took items for investigation. He’s not charged or even being held. Y’all just angry because you took a risk and lost. Now, you’re making stuff up to anger other people and place blame elsewhere. Everyday involves risk. If this is what y’all are saying is truth, then why isn’t it on the news or any other relevant website? It’s people spreading misinformation on social media. Grow up and accept responsibility for yourself. Ok, that’s why he’s a free man right now… because he did nothing wrong. If this is what y’all are saying is truth, then why isn’t it on the news or any other relevant website? Calabro’s scamming has been publicly documented on the North Carolina Securities Division website. Frank Calabro is a serial scammer. Get over it princess and stop making excuses for human excrement. You seem to be borderline illiterate. Calabro was hit with a securities fraud cease and desist, which has nothing to do with his family. The felony charges are still playing out AFAIK. I’m sure Calabro down played his indictment over the Easter holidays but it is what it is. Scammers rarely have the backbone to y’know, take responsibility for their actions. Frank definitely needs to take responsibility for repeatedly promoting scams. After pimping “opportunities” run by guys like Paul Burks, Charles Scoville, and others, he knew the risks involved. This isn’t accurate information at all. I live near this man and 99% of this write up is false. April Fools! Right Regina?? You really got Oz with that one! LOL! Regina Johnson: Y’all just angry because you took a risk and lost. Regina Johnson: If this is what y’all are saying is truth, then why isn’t it on the news or any other relevant website? Ah, that’s the thing, it is. I take it that Regina gets her ideas of how the law works from television, rather than from library research, personal experience, or having a police officer in her family. @ Regina, which of the 1% you state in #30 is accurate information? Seizures and charges just starts the clock ticking on Franks incarceration. It will take a few years before he goes to jail. Reading the charges & comparing similar cases he will get a decent stretch in the big house. Ponzi Midget Frank gets a nice showcase of his “talents” at the end. We were presented with a Bitcoin education product company called KryptoGenex. I was enrolled by Corporate as a founder and if you do not already have a position you can be at the TOP of our organization. If you decide to pass that is fine too but it will only take 3 direct sales to break even. Yes, I will build a share funnel in the very near future. On another note we will be putting together a complete Bitcoin / Crypto strategy in the coming weeks. There are several exciting developments going on in the space that we are researching. When the time comes we will hold a strategy session to reveal the entire plan. C&D be dammed, there be scamming to be done.